Wordpress or Blogger - What to choose and why ? 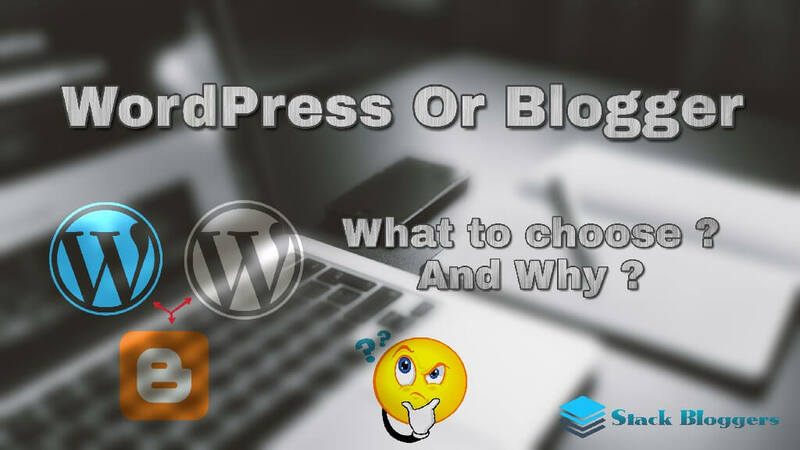 WordPress or Blogger – What to choose and why? While starting a blog you might have faced this question for your self? WordPress or Blogger. Well if it was a few months before I might have given priority for Blogger. I used to blog on Blogger as it was free. Let’s see pros and cons of both the platforms on each topic. What is Blogger? Should I choose it? Blogger is a free platform, as always free brings you some restrictions too. Blogger is user-friendly. In blogger, you don’t and can’t manage everything. Blogger may feel easy for you as you don’t see much things in your blogger dashboard. This just means that you cant control your site as a whole. Google has the complete ownership over Blogger and they could shut it down whenever they wish to. The only advantage of Blogger is its free and you don’t need to worry about its security. Blogger is a product of Google. So will it have any advantage over the search results? Definitely no, Comparatively Blogger is not at all SEO friendly. Even though Blogger is powered by Google, it does not have any advantage in search results. Comparing to WordPress, Bloggers is a failure in SEO. Even though it has many disadvantages Bloggers is still a good platform for blogging and its because Blogger is completely free. As a free platform Blogger is offering the best features and this makes it stand out from the crowd. I used to Blog in Blogger and it was really a tough time in getting good results. On the first day of my blog release on Blogger didn’t give me any search result. It took really a lot of time for my posts to get indexed and to rank high. TECH MOBS is my blog which is on Blogger you can have a check on it. I used to get organic 0 views for the first 2-3 weeks. The only thing I found useful with Bloggers is that its free to use with an unlimited storage. I don’t recommend you, blogger, if you are serious about Blogging. What is WordPress? What’s special about it? WordPress have two versions .com and .org. WordPress.com is somewhat same as Blogger, but it’s not fully free. You need to pay to have full access to your site. It is owned by Automattic. A paid version of WordPress.com has many features but you can freely install new plugins and change themes. Even though its paid Automattic own it and they could stop it at any time, this is its disadvantage. WordPress.org, what can it do? WordPress.org is a powerful platform for bloggers. It’s the best and popular content management system. WordPress is an open-source software. This means that anyone can contribute to the software to make it better. Contributions by thousands of independent people from across the world have made WordPress so famous and powerful. We could freely edit and create an amazing website or blog using it. No buddy owns it and therefore there is no need to worry about anything. Plugins made by thousands of developers are available for you at wordpress.org and you could easily make your blog to more than you expect. No programming knowledge is needed to use it as everything is possible in clicks. To start a self-hosted WordPress blog you need a proper hosting and a domain. You could buy these and start a self-hosted WordPress without thinking much. The first-day results of my blog with the self-hosted WordPress were really amazing. Posts where ranking up high in search. Compared to my experience with blogger, this one was really amazing. Stack Bloggers is made using WordPress and I feels it easy to use. If you are planning to start a blog don’t think much just start with a Self-Hosted WordPress. Amazing Article, Easy to understand, Thank you, Vishnu For this article. Was Really A Helpful Post. Thanks For Writing It. Thanks for such a great and usefull information.